“Cro Magnon type. History. 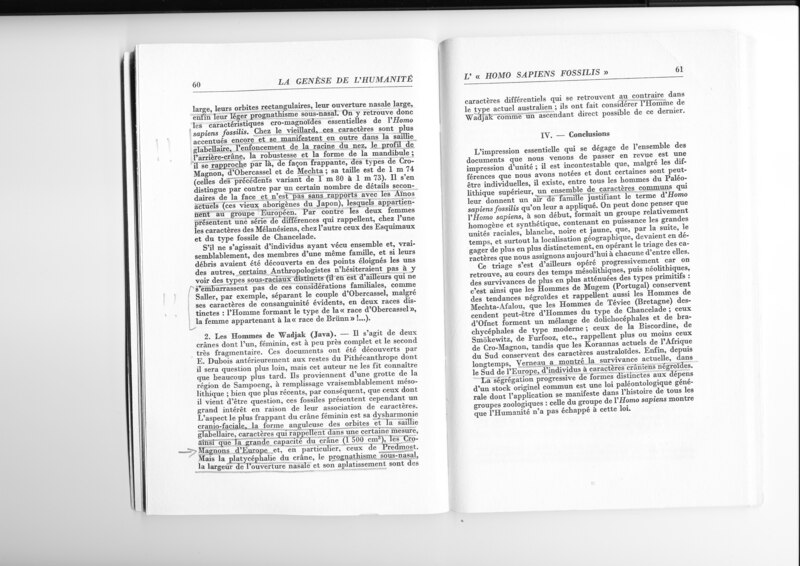 In 1868 the establishment of the railway line from Perigueux to Agen led to the discovery of five human skeletons buried in a rock shelter in the area of Les Eyzies, in the locality Cro-Magnon. These skeletons were in place on top of archaeological filling (Aurignacian industry), they included the remains of three men, an old man, a woman and a fetus. 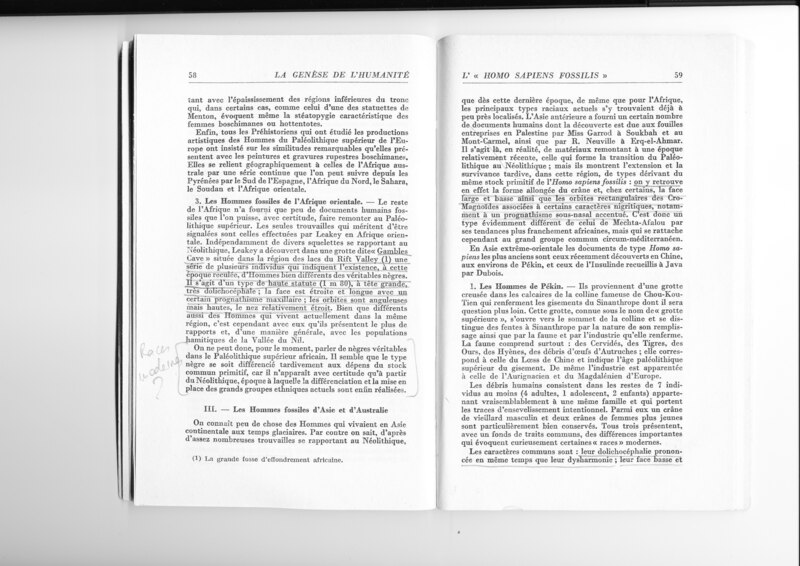 Debris were first studied by Broca and Pruner Bey, then by Quatrefages and Hamyqui who recognized in them as the representatives of a particular race to which they gave the name of Cro-Magnon. The characters of the Cro-Magnon race. The Cro-Magnon are characterized by their tall stature, their skeleton particularly robust, their heads large in the face orthognathic and modern look. Indicates them all in a powerful physical organization and a greater brain development. (…) The members are long and robust (…) leg is very long compared to the thigh, characters that differ from those observed in modern Europeans, but remember, even exaggerate, the features of negroes. The extremities are particularly large and robust. All long bones, massive insertions have prominent peaks, evidence of a powerful musculature. The relative development of shoulders, denoted by Verneau Grimaldi for individuals, as well as the proportions of their members shows that these Grimaldi individuals do not look like the modern Europeans and are closer to the black races. However, the shape and proportions of their pelvis are quite comparable to European pelvis. 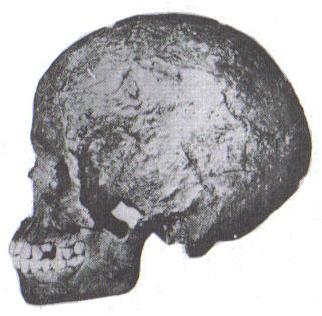 The skull is dolichocephalic, its horizontal outline is subpentagonal or oval. The forehead is broad and high, and when seen in profile, it forms a smooth curve over orbital arches, the occipital region present in some subjects, flattening feature which follows the ridge of the neck in the shape of a bun. The mastoid processes are highly developed. At the present time there are even some traces (of the the Cro-Magnon race) in some individuals of central and southern Europe. Its extension area did also not limited to Europe: all North Africa, from Morocco to Tunisia was inhabited during the Upper Paleolithic by humans who was very closely related to the Cro-Magnon. They differ by some secondary features: more variety in the shape of the skull, which in some subjects is hyper dolichocephalic, mesencephalon in others; glabellar protrusion is more pronounced, the nose is shorter and wider, etc.. Apart from this last character, almost every other signs fit in the margin changes among the Cro-Magnon type. This North African type had a considerable longevity throughout the Upper Paleolithic and Neolithic. In addition, the signs of this type are conserved among the Berber people today who seem to derive from it, as well as among the ancient Guanches of the Canary Islands. But it should be noted that a number of other human fossils, dating from the same time and usually attributed to the Cro-Magnon, seem to store, at least in a large part of their characters, next to the type from Chancelade. These are the first skeletons from Obercassel near Bonn, the one from the Duruthy cave near Sorde and the skulls from Laugerie Basse. The skeleton from Combe-Capelle, himself, a little older (Aurignacian), presents some features from the Chancelade type and some Ethiopic characters, and finally some skulls from Predmost (Moravia) also recall this type, especially concerning the height of their orbits. 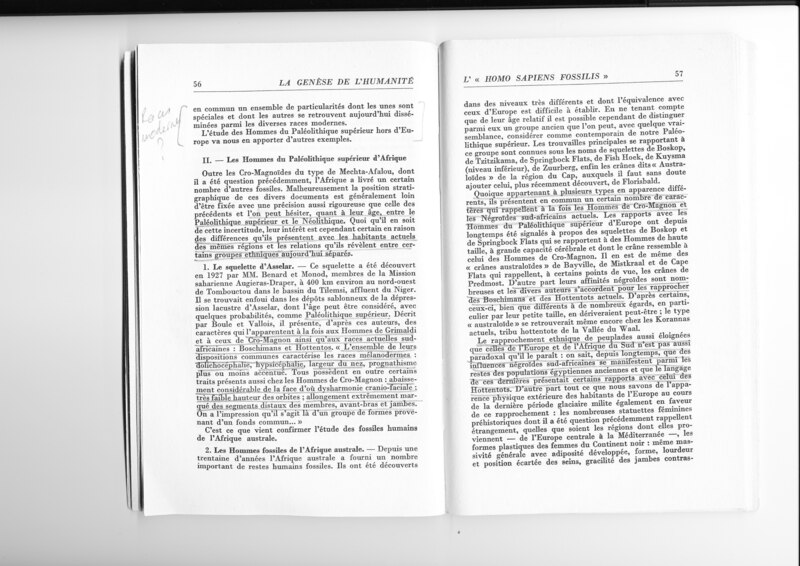 These various documents tend by decreasing the distance that at first sight seems to separate the types of Cro-Magnon and Chancelade, to show that in the late Ice Ages, on a common Cro-Magnon background is already grafted, maybe on individual or family basis, a number of variations which later were fixed at the state of distinct races by geographic isolation. These individuals differ at first sight the Cro-Magnons individuals by their much smaller size (about 1m60); their head, even more disharmonious, and their hyper dolichocephalic skull and particularly low face, the front is straight and the skull high; the cranial capacity reaches 1580 cm3 in the adolescent; the nasal opening is wide (platyrrhinienne) and there is a sub-nasal prognathism. The massive teeth is a primitive type and look likes Australians today. Finally, the pelvis is negroid, and proportions of members also. These two subjects have so much negroid signs, that without allowing to state they were true negroes, they indicate the existence, on the Mediterranean coast at the beginning of the Upper Paleolithic, of individuals with certain negroid characteristics. But we must not forget that we have found in the Cro-Magnon humans themselves, in the proportions of their members in particular, some signs that reminded, or even exaggerated, those that negroes has. 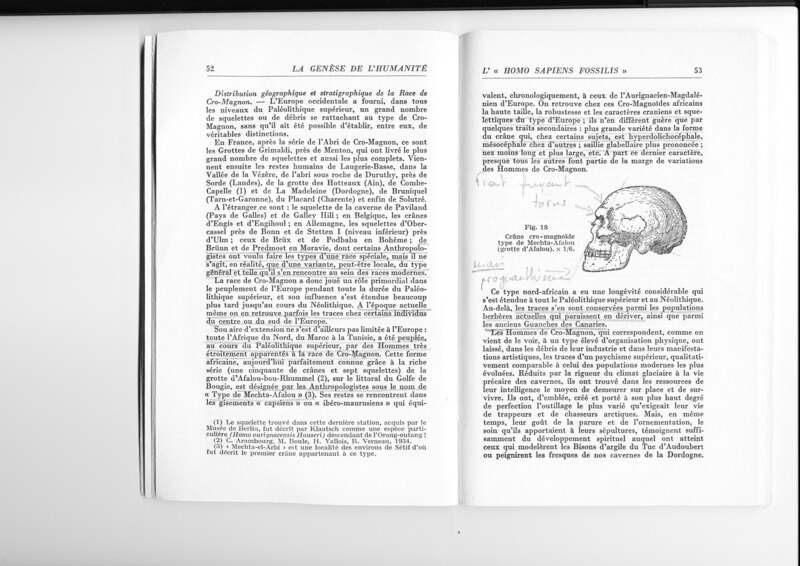 On the other hand the considerable capacity of the skull, and his height, the disharmony of the head, the rectangular shape of the orbits and some prognathism is found in individuals of Cro-Magnon type. In addition to the Cro-Magnon individuals of the Mechta-Afalou type, which was mentioned previously, Africa has delivered a certain number of fossils. Unfortunately, the stratigraphic position of these various documents is usually by no means fixed with a precision as rigorous as that for the previous and concerning the date, we can hesitate between the Upper Paleolithic and the Neolithic. Regardless of this uncertainty, however, their interest is certain because of the differences they have with the current residents of the same areas and thus, they reveal relationships between ethnic groups that are now separated. (…) it has, according to Boule and Vallois, characters that are similar to both Grimaldi humans and Cro-Magnon humans and the current races in South Africa: Bushmen and Hottentos. “All their common features characterize melanoderm races: dolichocephaly, hypsicephaly, width nose, more or less pronounced prognathism. All also possess certain traits present also in Cro-Magnon humans: considerable lowering of the face giving a craniofacial disharmony; very low height of the orbits; very marked elongation of the distal segments of the limbs, forearms and legs . The human fossils from southern Africa. The reconciliation of ethnic tribes as far away as Europe and South Africa is not as paradoxical as it seems: it has long been known that the South African Negroid influences occur among the remains populations of the ancient Egypt and that the Egyptian language had some relations with that of Hottentots. Leakey discovered in a cave called “Gambles Cave” located in the lakes of the Rift Valley a series of several individuals who indicate the existence, at this early period, of humans that are very different real niggers. It is a tall type (1 m 80), head high, very dolichocephalic, the face is narrow and long with a certain maxillary prognathism; the orbits are angular but high, and they have a relatively narrow nose. We know little about the humans who lived in mainland Asia during the Ice Age (…) We find, in fact, the elongated shape of the skull and, for some, the wide face and Cro-Magnon low rectangular orbits associated with certain negroid characteristics, including a increased sub-nasal prognathism. The common characteristics are their pronounced dolichocephalic together with their disharmony; their low and wide face, their rectangular orbits, their wide nasal opening, their slight subnasal prognathism. Thus we find the Cro-Magnon characteristics that we find in Homo sapiens fossilis. In the old man, these characters are still more pronounced and occur also in the glabellar protrusion, the penetration of the root of the nose, the profile of the back skull, the strength and shape of the mandible, it is strikingly close to Cro-Magnon types, and to the types of Obercassel and Mechta, its size is 1m74 (the precedents was from 1m80 to 1m73). It is distinguished however by a number of minor details of the face and is not unrelated to the current Ainos (old aborigines of Japan), who belong to the European group. Though the two women have a number of differences that remind in one of them the characteristics in Melanesians, and in the other those of the Eskimos and the fossil type of Chancelade. If the author concludes that these descriptions show a common background, and that differences between individuals, races, or Co-Magnon peoples are probably evidence of the emergence of different human races, I on the contrary, myself, other consequences. This book was written in 1969, when it was no concrete question about a Neanderthal / Sapiens hybrid. The author therefore claims that these amazing differences between individuals and Cro-Magnon peoples are evidence of a common basis from Africa that deviate in distinct races that are adapted to the climate of their habitat. Several problems, however: there is no common basis, but differences from the beginning, in addition, the climate in different parts of the world has dramatically changed since the emergence of Cro-Magnon, including at the end of the last ice Age in -10,000. Why then have the races not been dramatically transformed again? This is the famous Out of Africa theory. As I explained in this article, the major problem with this theory is that it is illogical. The African has no valid reason to travel in the middle of ice Age, and on the contrary, Neanderthal would have had grounds to move to Africa. The more species around the Mediterranean are mixed, the easier it is genetically and culturally for them to mix again ; just as the grizzly bear, which I mean is already a brown bear hybridized to a polar bear, mixes today again with the polar bear. After a while, these sporadic mixtures create a so important gene flow that almost all species is quickly changed. This is Cro-Magnon, the, we may say, mestizo (in the sense Sapiens x Neanderthal, this means at that time African x European mestizo, almost the same as today mestizo), which arrives in Europe in -40 000. As I explained in the video and here the shape of the head especially changes dramatically and quickly, because of the narrow pelvis of Sapiens, and (some) Cro-Magnon. Simply, as it would happen in some cases if we (precisely because of this problem) do not had invented the Caesarean section : The children with a big and inadequate shaped Neanderthal head are never born, or are born with brain damage so they died. As you know, the skull bones of a baby are not welded, but the size of his head, and all women who gave birth to a child know that, can not be modified without unduly damage to the brain. It is common for the newborn that is born vaginally to have an egg-shaped head at birth, but if the head is too big, it will not pass. This is mechanical, the pelvis can change a little, the baby’s head can change a little also, but if it is too big for a too small pelvis, the baby will not come out and will cause his own and his mother death. The official date of the “disappearance” of Neanderthal is -28,000, and the Cro-Magnon is no longer called Cro-Magnon in Europe (because they no longer look like the original type) around -20,000, when they modestly prefers the name of « modern man », we understand that there is something missing. 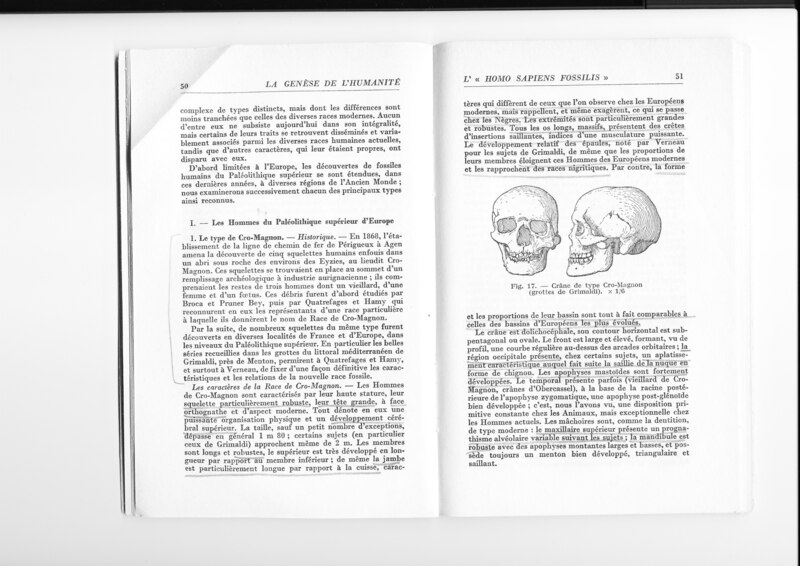 If you read the extracts above from the genesis of humanity, you will notice that some of the many and uncertain Cro-Magnon types, such Predmost (-25,000) looks like a Neanderthal (Just look at his skull! If a description is not good enough, the eye can not be wrong …), but also that larger brains are in …. Europe. This is in agreement with a new hybridization with Neanderthals in Europe, a hybridization that has eliminated purely Neanderthal fossils (or are dramatically changed the Neanderthals), but also removes the very mixed Cro-Magnon. Cro-Magnon in Europe has become (almost exclusively) Neanderthal, although the shape of his head has changed a lot since he went through a sapiens pelvis. Even today, the European head type is closer the head type of a Neanderthal than a black African, which has, by the way, very round forehead. Europeans have the most sunken eyes amon the different human races (probably a remains from the supraorbital ridge) and the bead above the orbital greater. The front is more often shorter and more sloping, and they have nasal bones, as we already have mentioned, this feature comes from Neanderthal and the other races in the world do not have it. The hybrid has again mixed with Neanderthal and then has (more or less) stabilized itself to give the European type. If the Predmost skull and the Grimaldi skull are from the same period, and from about the same region, then how can we claim that it is the environment and climate in Europe that made ​​the Europeans european? 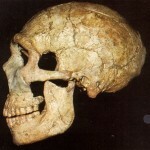 Until then, the theory of evolution was based on the increase in the cranial capacity, but in front of Neanderthal and Cro-Magnon, scientists find explanations such as “it is likely that we use our brains more effectively today “or” we use only a small part of our brain anyway “which, by the way, is both a nature heresy (why feed a unnecessary brain), and we know at this is wrong by the help of MRI technologies that are able to study brain activity. Who have said evolution? Is that not ideology? As explained in this article, the color (skin, hair, eyes) is obviously important. Dark Skin, hair, and eyes are not from Neanderthal, and their presence in the European peoples is clearly a sign of genetic mixing with the african sapiens. These elements are not verifiable on fossils, but when we are aware of hybridization, it is heresy to suggest that the phenotype changes radically depending on the environment. As I already said before, all the elements go in the opposite direction. On the contrary, the phenotype is due to hybridization. Of course, skin color is not the only factor that plays a role, but it is one of the most visible and it often goes hand in hand with the rest. Skin type, hair type, shape and size of the nose, mouth, and body are also visible signs, but there are also less visible and invisible signs. However, the races are formed from the hybridization, and they are clearly visible. The Nordic type (that was the classical European type into antiquity) would be the type, that on average, are closer to the original Neanderthal. The type in North Africa and Ethiopia, and in South Africa is also (but less) mixed with neanderthal. People from Lapland, the Asian, Australian, and Indian types are also mixed with neanderthal, but it seems that there is an additional component, probably the famous kind of Denisova, as suggested by genetic studies of the Max Planck Institute on the Denisova hominin (that I do not have studied in details). Hybridization, which is present in almost all the peoples of the world today, but at a higher or lower grade, generates a lot of conclusions. As I was showing in this article, whose the purpose was of course determined. Beyond the trivial problems of teeth and craniofacial disharmony, well known among Cro-Magnon and regardless problems with skin color and hair, that cause deficiencies of vitamin D, and growth problems and / or rickets, as I have explained before, the vitamin D deficiency itself seems to be aggravating cause of most diseases, including cancer, since it plays an important role in the preservation and development of the immune system . Regardless of this, and as it was outlined in the results of genetic studies I’ve detailed here, the immune system in general seems affected, metabolism is disturbed, the hormonal system, fertility, fertilization, and the organization of reproductive system is affected, the development of the embryo, and finally, and this result is important, the brain, the senses and the nervous system are greatly altered. It is however necessary to recognize different types of consequences. Since almost all current races are more or less mixed, there are consequences of hybridization with Neanderthal dominance, and vice versa. There are also stabilized consequences (very old hybridization at the time of Cro-Magnon) and unstabilized consequences (with recent hybridization). The diseases that are most likely related to hybridization has as example diabetes, which is very common among very crossbreed peoples as Indian or Jewish population. This is 6.45% to 13% of the Israeli who is sick while, and for comparison, the disease affects 4.4% of the French population. « Entre 2000 et 2009, le taux de prévalence du diabète* en France n’a cessé d’augmenter. Il a même progressé plus vite que prévu. En 2009, on estime à plus de 3,5 millions le nombre de personnes atteintes, des chiffres attendus normalement pour 2016. Ils témoignent d’une véritable croissance de l’épidémie. En ligne de mire, comme causes principales du diabète : surpoids, obésité, mauvaise alimentation, sédentarité et faible activité physique. “Between 2000 and 2009, the prevalence of diabetes in France * has steadily increased. It even grew faster than expected. In 2009 it is estimated that 3.5 million of people affected, a result normally expected for 2016. They show a real growth of the epidemic. In Focus, as the main causes of diabetes: overweight, obesity, poor diet, physical inactivity and low physical activity. Is it really an epidemic related to diet and physical activity, or is it, like obesity, a problem of metabolism related to the hybridization of several different metabolism? Why are clearly hybridized people obviously most affected? Why does nobody reveal this aberration? These percentages are of course included in the overall French percentage. And yet, the people of these countries/regions do not have a special unhealthy or industrial diet (although these eating habits have increased in recent years, and although this is obviously a contributing factor for diabetes). But most importantly, this is probably what happened with the weapon of the human being: the brain. When the brown bear mix polar bear to produce a grizzly and later a pizzly, it follows some problems, including camouflage, strength, ability or inability to climb trees, survival, etc.. But the problems are stabilized by natural selection, and even disappear if the new race or species is not viable in its environment. These hybrid animals are also more likely to be domestiquables (dogs). When the main instrument of the hybridized species is the brain, then things get more complicated and more serious. The hybridized humans hasvarious physical problems, which are stabilized, he is more inclined to domestication, which becomes a self-domestication, since the environment does no longer suit him more, and because he no longer suit his environment, but this is the visible part of the iceberg, as we say, because his brain was moreover, the most transformed, has suffered immeasurable turmoil, and the consequences thatwill have on how to he will see and understand the world arround him will be immense. Hi, I’m Fabio from Italy. Congratulations for the latest article, it is also a summary of important parts of the others. 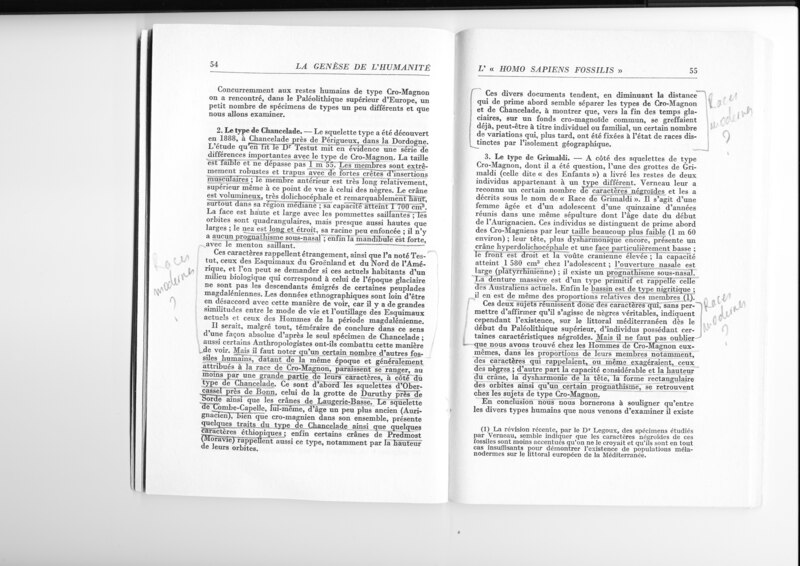 You say this is an Online Book…never think to write and public a real Book about your studies? P.S. Good Luck for You and Varg fot the Film and excuse me for the bad english. Congratulations! This information is very interesting! and also difficult to find in other places. As you say, in west France the precense of non european races is very low compared to other places, As I’ve been there some weeks I could notice that. Good Luck!! I am comfused. I have been investigating about the colour eyes and I read that the blue eyes colours are a mutation that had one Neanderthal and that all the descendents of people with blue eyes are descendents of that Neanderthal. I found grey eyes are like blue eyes,but with less melanina. So, grey eyed people are sons of that Neanderthal too. But the reason of my confusion is that I read that grey eyes are common at Scandinavian and Baltic countries, and that grey eyes can be found at some arabic countries. So, what happens here? I truty cant understand. Touching article… And the most sad thing is that alternative perspectives are not showed in schools or even tolerated. So we have too seek an “untrodden” path to find the truth. Thank you! I am very interested in your claims that original Europeans all were blonde-haired and blue-eyed. I heard studies on Neanderthals discovered that they had red, brown and blonde hair – red is notable among them, but they had different hair colours. Can only hair colour be proof of mixing with African sapiens? Can you please tell me how did you found out that our ancestors were all blonde and blue-eyed? Based on your Neanderthal description, I look very similar, with facial angle of 91 deegres, “Nordic” head shape, large kneecaps, upper arm longer than forearm and eyebrow bones are visible. But I have brown hair and green eyes. Again I kindly ask you to explain to me how did you came to conclusion that all original Neanderthals had light hair and eyes?